Plastic paint mixing tray. Six compartments. Great for watercolors and other paints. Measures 5-1/4" x 3-1/2". Pack of 12. Check the description size because these are much smaller than i expected or the picture makes them seem. Expected something closer to muffin tins for use with paint but they really aren't good for much but a little liquid watercolor. More appropriate for older elementary. Works great to contain paint and easy to clean up! 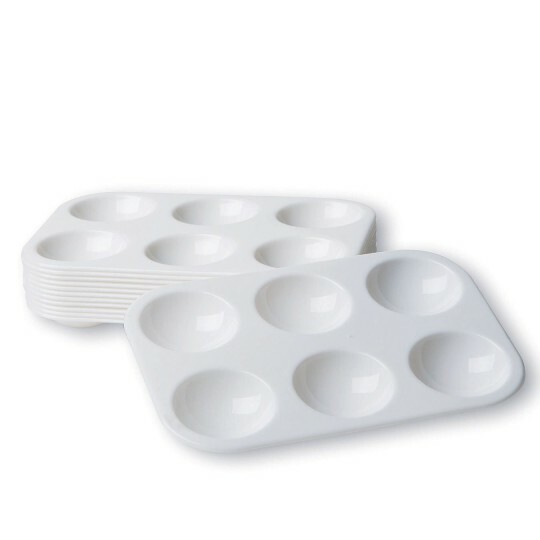 We have used these trays several times and they wash up great and stack easily to store. We've even left paint in them overnight and they are a breeze to clean! I work at an activities department at a 5 star resort. We do crafts everyday and usually have at least 20-30 participants per craft! So this product works great for what I need. I do wish that it does hold more paint in each bellow but I just refill it when someone needs more. These are really too small to even use with the age of children I work with 3-5. Unfortunately I will never use them.